My Little Patch of Sunshine: Pets Without Poop! LOL! Mom Select and the company that makes Go Go Pets asked if we'd throw a party to introduce Go Go Pets to the Phoenix area. 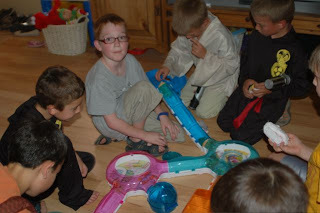 We're not the type of family to turn down a party, so we invited 9 friends over on May 28 to share these fun toys. The tagline of "Pets without Poop!" cracks me up! But, it's the perfect tagline for these small, mechanical hamsters. They make sounds, move around, and seem to explore their environment -- just like a real hamster might do. The beauty of these pets, however, is that there is no cage to clean, no food to buy, and no rattling noises in the middle of the night! 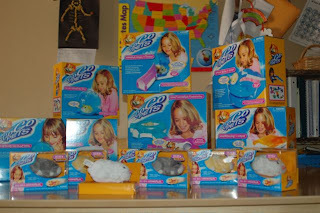 We were sent 11 hamsters to pass around to our friends, and a set of habitats for the creatures to play in. It took about an hour to remove everything from the packaging and set up all the habitats, but the kids that came over had a great time playing! They were very interested in how the hamsters were able to crawl through the tunnels, drive the little car, and zoom around on our floors. The habitats all connected to one another, so it made for a rather large toy. The hamsters are currently available in the Phoenix, AZ area, but will be available nationwide in the coming months. The hamsters retail for about $7 each, while the habitats vary in price from $10 - $20. I think the pets themselves were a hoot to play with, and I can definitely see the fun of having one or two of the playsets. My favorite was a small car that the hamster zooms into, and then appears to drive around the floor. To buy all the sets would take up quite a bit of room, since they don't easily break down again, so you'd have to have a large playroom in order to enjoy multiple habitats. My video camera battery was dead the day of the party, but I did take a video of my boys playing and recorded some of their thoughts. We had a fun party, my kids enjoyed the creatures, and they have continued to play with the pets since the party. Thanks to Mom Select and Cepia for letting us be part of this tour! We had a blast. These look cute. I'll have to keep an eye out for them.